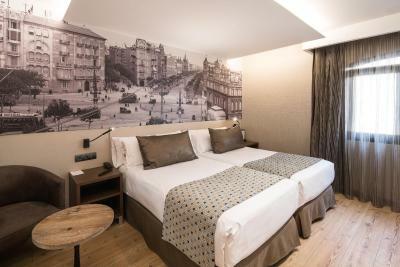 Lock in a great price for Catalonia Born – rated 8.9 by recent guests! 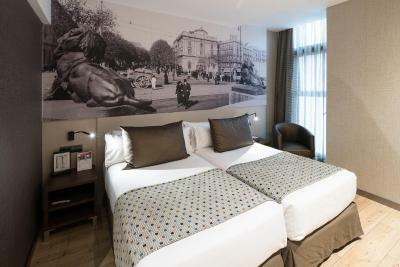 The room was super clean, the bed was very comfortable and the staff was super nice. The lady at the reception, Maria Jose, made sure everything was perfect for us and our little children. Staff were helpful. Hotel is clean, quiet, and modern. 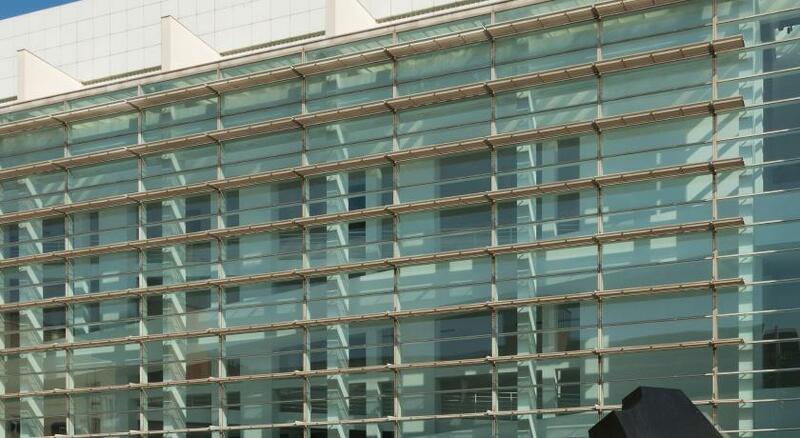 It is 2 blocks from metro station and easy to travel from there. Location location location. Arc de triumph and metro stop close by. You can get anywhere! Staff was amazing and the hotel has a fine “happy hour of sorts” each evening with coffee tea and lite supper items. Very friendly staff, great location, very convenient. We upgraded to the superior room and it was so good. Great bed as well. If you like walking a little bit (10 minutes approximately) then the location is great. Having the bus drop me off at Plaça de Catalunya, it did not take long to walk there. Nice quiet area considering it was located near a popular site. 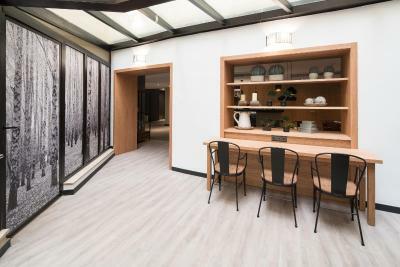 A long hallway to the room gave the perfect feel for privacy. Note: not having anything in the hallway made it like a speaker and microphone of people passing my door. *Not sure in both directions? Simple and super clean, Loved it! The only good thing about this hotel is the location. 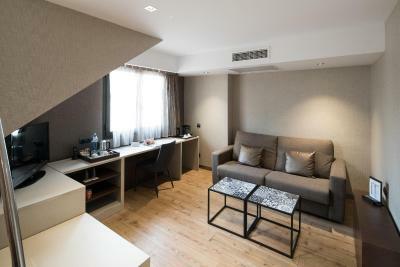 Catalonia Born This rating is a reflection of how the property compares to the industry standard when it comes to price, facilities and services available. It's based on a self-evaluation by the property. Use this rating to help choose your stay! 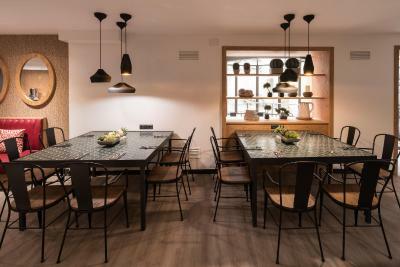 One of our top picks in Barcelona.Set in a 19th-century building in Barcelona’s El Born district, Catalonia Born offers a rooftop pool, an attractive central courtyard and free Wi-Fi. 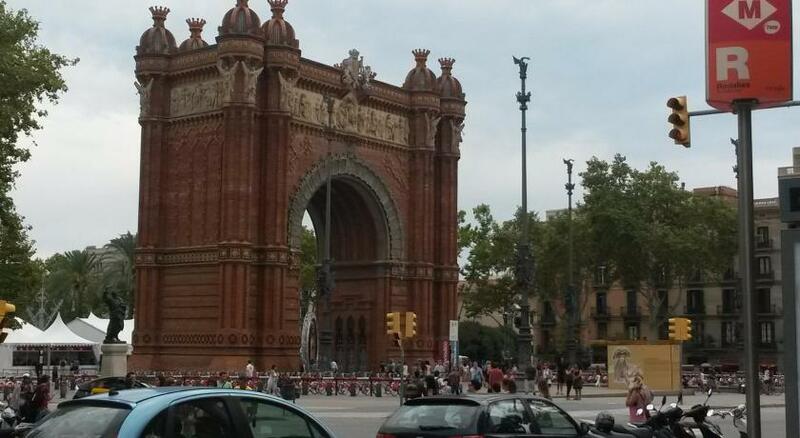 Arc de Triomf Metro Station is 800 feet away. 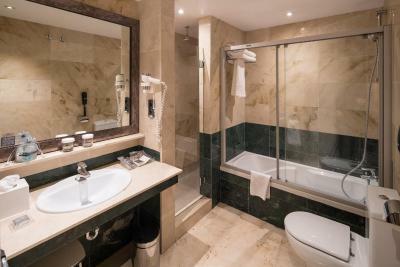 The classic rooms at Catalonia Born Hotel come with an elegant marble bathroom. They also include a satellite TV and centrally controlled heating or air conditioning, depending on the season. A buffet breakfast is served, and the snack bar is open for lunch and dinner. 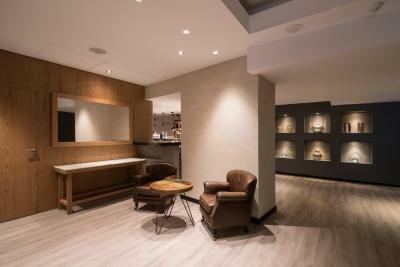 There is also a bar in the lobby. A free snack and drink service is also available from 14:00 to 23:00. 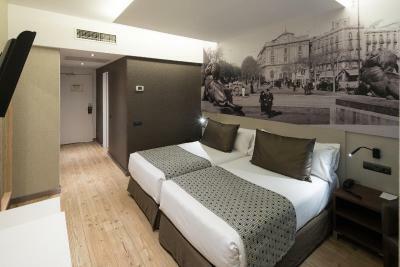 Located minutes from França Train Station, the hotel is well-connected to the rest of the city and its surroundings. Car rental is also available from the tour desk. When would you like to stay at Catalonia Born? 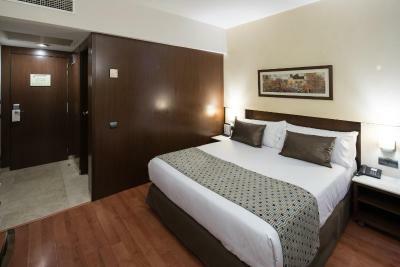 Air-conditioned room equipped with satellite TV, minibar and safe. 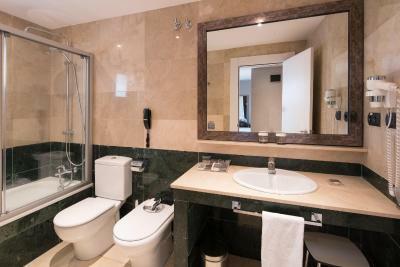 It also includes 2 types of pillows and a private bathroom with bathtub or shower. Public parking is available at a location nearby (reservation is not possible) and costs EUR 28 per day. 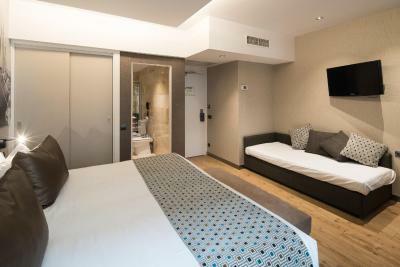 Opening onto a terrace, this air-conditioned room comes with satellite TV, a minibar and safe. It also has 2 types of pillows and a private bathroom with a bathtub or shower. 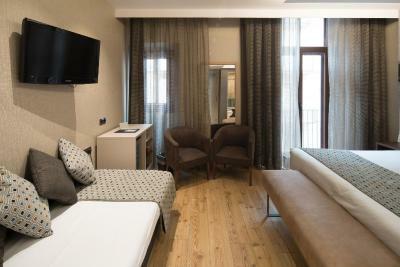 Air-conditioned room equipped with satellite TV, minibar and safe. It also includes 2 types of pillows and a private bathroom with bathtub tub or shower. This suite also comes with a private terrace. 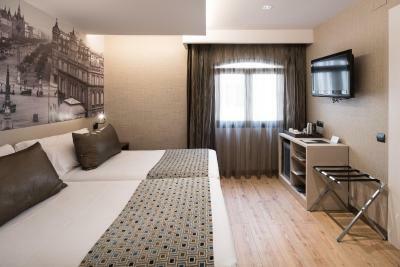 This air-conditioned room features a flat-screen satellite TV, free Wi-Fi, minibar, tea and coffee maker. 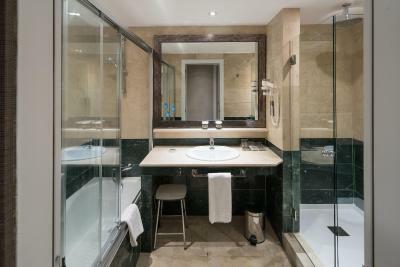 The private bathroom includes a bathtub and shower. Free toiletries and hairdryer are provided. 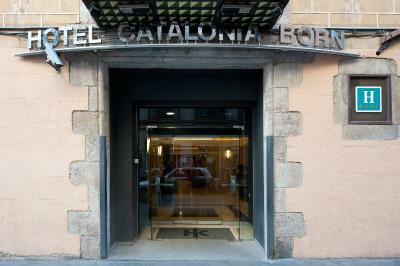 Catalonia Born, is a quiet and familiar hotel, were you will find very easy to make yourself at home. 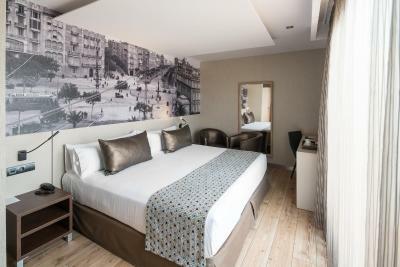 Our wonderful hotel is located in the famous neighborhood “EL BORN”, one of the most fashionable places in the city, full of nice restaurants and small shops. 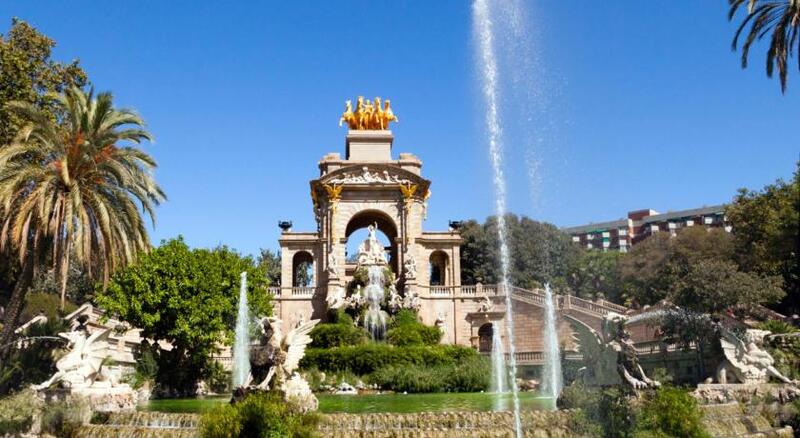 Just beside the hotel you can find the Arc de Triomf monument, the music palace (from Lluís Domènech i Montaner), Barcelona’s cathedral, Santa Caterina market and Ciutadella Park, where you can relax and do some sport. 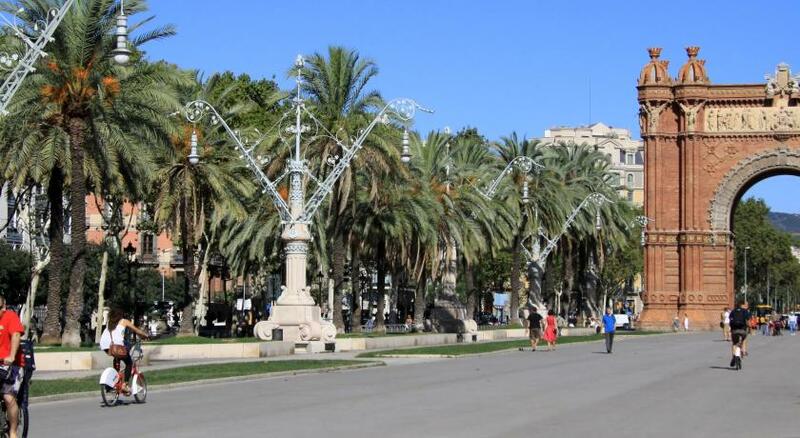 Also in this park there are placed the Catalonian houses of parliament, and the zoo. 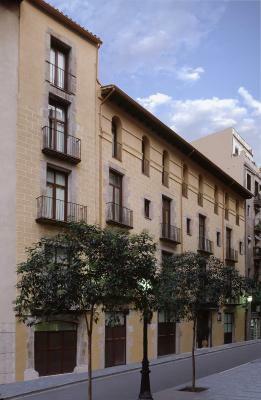 Picasso’s museum is 9 minutes walking from the hotel, and Catalonia square is 15 minutes away from our hotel also by walk. 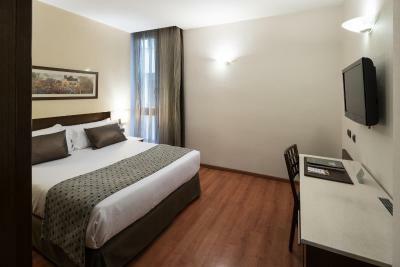 In the center of the city you will enjoy your stay in a comfortable and calm room, relaxing on the terrace or taking a swim in our pool. Our team and I are looking forward to welcome you. House Rules Catalonia Born takes special requests – add in the next step! Catalonia Born accepts these cards and reserves the right to temporarily hold an amount prior to arrival. Please note, parking rates vary depending on the number of nights booked. Please, contact the property directly for rates and directions. 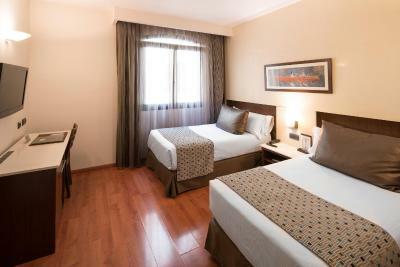 Please note that all rooms have centrally controlled heating or air conditioning, depending on the season. The room was excellent. Huge bed, clean and comfortable. Great location and amazing roof terrace. Room view was not good as it was facing a small interior garden. Room was not very spacious. The staff are very friendly, the hotel is in a perfect location. 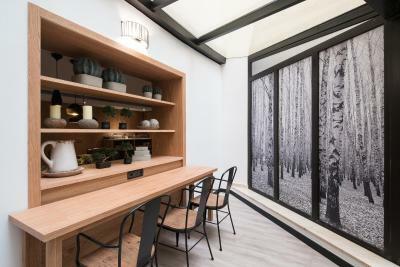 Fantastic location In El Born. Staff were great and the breakfast excellent. Would stay here again. Refrigerator in our room did not work. Location is excellent. Near to lots of good bars and restaurants, and quirky stores. Great hotel with very friendly and helpful staff. Modern, clean and light. 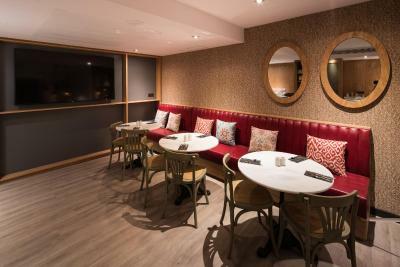 Nice little bar area. 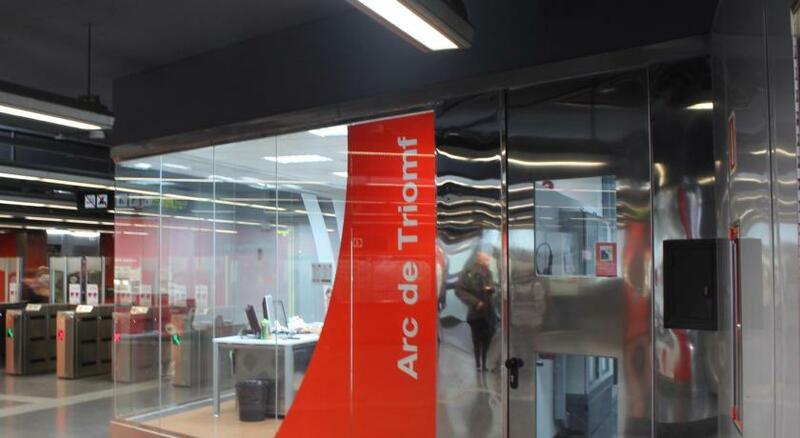 Superb location, near Arc of Triumph and Zoo, to center about 20 min, close to nice cafes and restaurants. 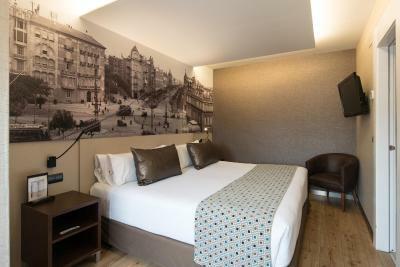 Catalonia Born is a practical, clean, and comfortable hotel, perfect for short stays in the city. 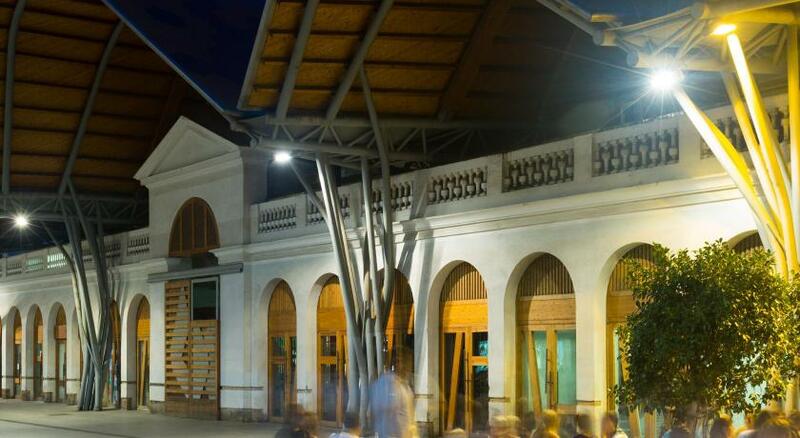 It is centrally located, amidst so many cute little stores and restaurants. The rooms are not particularly large, and I would recommend an airbnb or a different hotel for longer stays. However, we chose this for our last night in Barcelona, and it served its purpose flawlessly! The staff was also very kind and helpful.